He is? I must hang around different people than Angel Martinez, because Tom Brady is the guy every guy I know does not want to be. Despite being married to a supermodel, one of the greatest quarterbacks of all time and a multimillionaire, Brady has somehow managed to make himself a punchline. A punchline, that is, to everyone outside of Angel Martinez's circle of friends and people who don't sound like extras from a Mark Wahlberg movie. 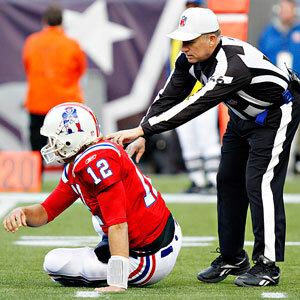 AP Photo/Robert E. Klein Tom Brady gets some help from his best friend. at least not with his impressive resume on the field to counter it. But then came the frosted tipping point. He grew his hair like a teen pop sensation. And kept on growing it. And now he's endorsing a -- let's not pretend otherwise -- a women's shoe line. It's a slippery, hair product and moisturizer-covered slope. And Tom Brady is falling down it with no end in sight. The problem is that Brady, like Martinez, must truly believe that if he does something, it is therefore manly -- even though in the American tough-guy-macho scale of Chuck Norris to Richard Simmons, it's hard to argue that Brady is anywhere near the Norris side these days. So where does it end? If Brady thinks attaching himself to something makes it manly -- even though the reality is the complete opposite -- what will he be convinced to endorse next? Skirts? Skirt company CEO: "Great Scottish warriors wore skirts, or kilts. And who better to remind people of that and sell skirts to men than Tom Brady?" Makeup? Makeup company CEO: "Being tough means never letting people see you sweat. Who better to sell cover-up to men than Tom Brady?" Feminine hygiene products? Feminine hygiene products company CEO: "I'm just trying to double our market share. Who better to sell women's products to men than Tom Brady?"